Sometimes, when it seems like nothing is going right, we need to take a step back, look around, and count our blessings. And that’s what I’m trying to do today. I’m trying to think of what’s going right instead of focusing on what’s going wrong. I’m trying to have a little perspective. I’m trying to be grateful for those who give without expecting anything in return. 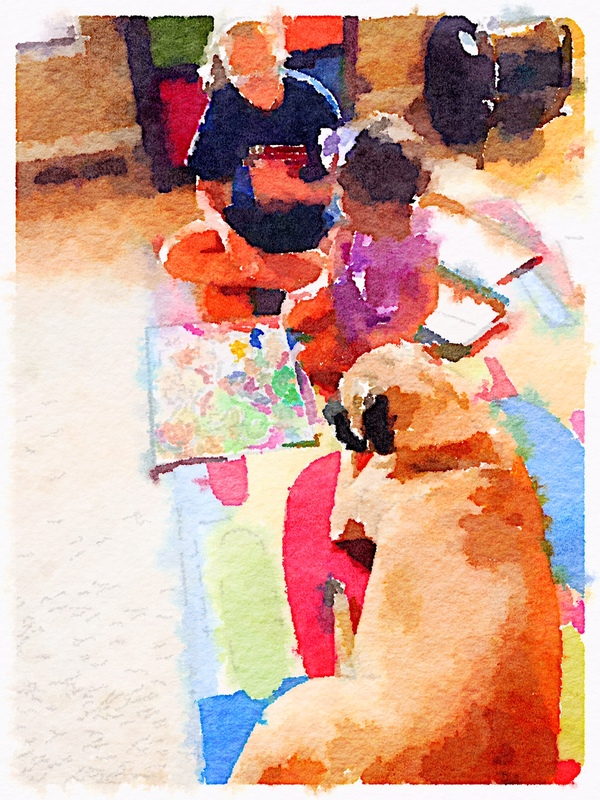 Isabelle sits between Sophie and Tiny playing Candyland this morning. Rachel — my friend of 20 years, who has checked-in on me from her new home in South Africa almost daily. Robyn — whom I’ve known for nearly six years, who sends me short messages nearly every day and called me — from her vacation — to see how I was doing yesterday. My neighbors — Kathy and Lori — whose encouragement and willingness help remind me I’m not alone even though I don’t have family nearby. Michelle — whose card brought a smile to my face. Emily — whom I’ve known since a high school summer trip to France — called to check-in on me as soon as she returned from Europe. Sarah — who walked over to me when she saw me at Hersheypark yesterday when she could’ve walked away and avoided an uncomfortable conversation. That’s the mark of a true friend. Lynne — who is both a mentor and friend — is doing the lion’s share of the work for an upcoming conference proposal we’re putting in together. I would’ve understood if Lynne didn’t want to pick up my slack, but she was willing. My critique group — Catherine, Julie, Margaret, and Melanie — who are accepting of my absence as part of our Sunday night writing group. I know they’ll welcome me back with open arms when I can rejoin them, which will hopefully be by the month’s end. My in-laws — who I know are just a phone call away. My parents — both of whom have given me unwavering support. Isabelle — who despite her tender age and doesn’t know what’s going on, knows that Mommy is going through a tough time. She’s been there with gentle kisses and arm rubs when I’ve least expected it. My dear husband — Marc — who knows hugs are better to give when there are no words left to say. Today, though, I’m most thankful for my neighbor Lori, her daughter Sophie, and their dog Clementine (aka: “Tiny”). The three of them watched Isabelle when I went to the doctor since Marc came with me. It was the kind of appointment we didn’t want to bring Isabelle to so the three of them gave up their morning to spend it with Isabelle in their home. (NOTE: I’m not dying of some kind of awful disease. In a few weeks’ time, my body and spirit will recover from what it’s going through right now.) It’s quite incredible to have someone you can leave your child with without any reservation. I went to my doctor’s appointment and “took care of business” this morning with a clear head. Lori sent me photos of Isabelle playing (and posing) with Sophie and Tiny, which brightened my morning. Through HONEST writing I’ll do once I relocate my muse, I am sure I will make lemonade out of the lemons life handed us nearly three weeks ago. Until then, I am counting my blessings (as trite as it sounds) since I have an incredible support system of friends and family members around me. I am grateful. Stacey, I’m sorry for your medical challenge and am relieved it is something from which your body will recover. The spirit takes time. You are so right about gratitude and the power of stepping back and being thankful in the midst of hardness and heartache. I kept a gratitude journal in 2014 and it made all the difference as I navigated through a tough year. Your writing is honest and true right now. Sending you wishes for peace and healing. I always find my mindset is different when I reposition it towards gratitude. This post actually came about thanks to my daily Headspace meditation. I’m on the “gratitude pack” and Andy Puddingcombe (who narrates each day’s meditation) encouraged listeners to write about something you’re grateful for today. This seemed like the perfect task for me right now. Finding time and strength to be grateful during life’s challenges is a gift. It’s hard. It doesn’t change things, but maybe it changes you. Holding you in my heart and I’m so grateful that my little card brought a smile to your face!! It really did. Thank you again! And, yes, we do need to get together once this chapter of my life is closed. I’m looking forward to starting a new one soon. 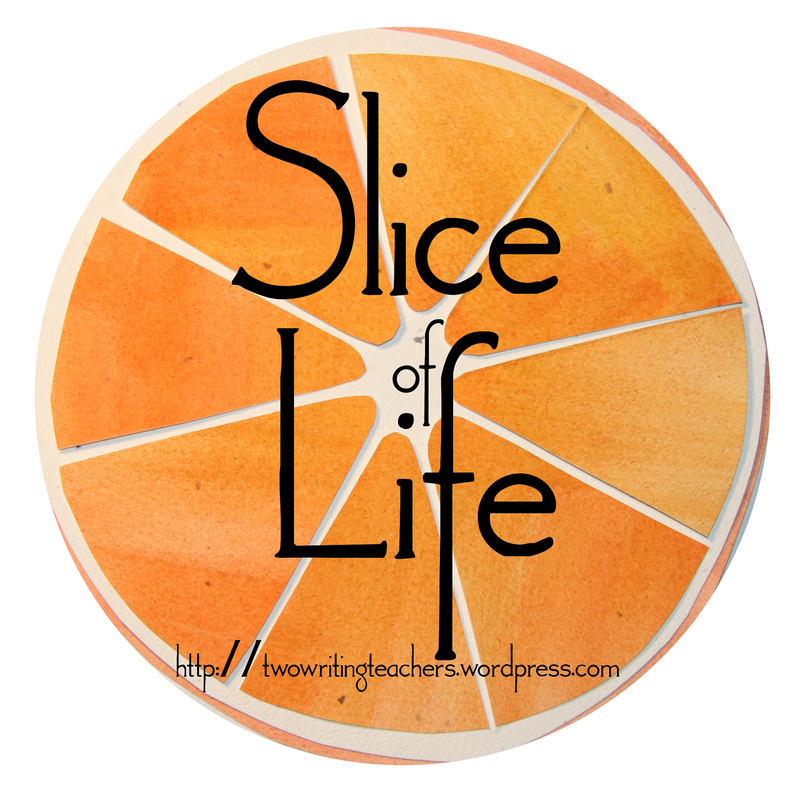 I am not a Slicer but have met some and enjoy reading all the pieces I am lucky to see. I am sending you healing thoughts and hope that your journey through this and to regained good health eventually, will be as easy as possible. It is wonderful to have such special people in your life during trying times. I loved reading about the arm rubs from your daughter. When I was teaching I returned from a former student’s funeral which I attended while my class went to PE (the church was close by). I was very sad and a particularly challenged student gave me arm rubs as we visited during snack time. I never forgot her kind attempt at sympathy. (PS All this while I was being observed all day as part of a big NY State program at that time called something like School Success Review. I had volunteered in order to keep the pressure off some colleagues. I couldn’t believe the reviewer just didn’t say he would go someplace else, but he stayed and I persevered……long story.) Anyhow, I know you will make the best lemonade. Best wishes to you. You bring so much light to others from your sharing on so many levels. Thanks for sharing your story with me, Janet. Truly you are one of the most remarkable people I’ve ever met! I am glad to be able to offer support in the small way I can. I wish I could do more. You have followed Mr. Rogers advice to look for the helpers in tough times- the people you have listed are the “helpers” of the moment and how gracious and lovely that you have taken time to thank them and express gratitude. The “lemonade” is the people who love you and stand with you but I”m so sorry life has handed you some lemons. Thank you for including me in this post and know you continue to be in my prayers. I love the Mr. Rogers analogy. Looking for the helpers is the better way to live, isn’t it. I love your writing. Thinking about you. You’ve got this! No thanks needed my friend! It’s what we do. There’s a reason for all of this and some day, it will show itself. For now, just know SA is nothing but a call away (and not for a mail order bride ;-)). Big hugs! So sorry you are going through this tough time, Stacey! Sounds like you are approaching it with a really positive attitude and that there are lots of people to support you! Sending lots of prayers and good thoughts- better days will come soon! Thinking in gratitude in time of trouble always helps to make the days more bearable and sometimes almost holy. When I have had some of my darkest hours I always remember what Eleanor Roosevelt said – “It is better to light a candle than to curse the darkness”. I hope that your medical crisis end quickly and that you have a complete recovery. This topic of gratitude has been near and dear to my heart over the last few months. I recently read a blog on the topic on supporting someone going thru something that you don’t understand. She broke it down into three simple yet powerful steps. 3.don’t try and fix it. The simplicity and beauty of those steps has truly struck my heart in how true they are. I’m glad that you are surrounded and see the support around you. All the best during this time. How important it is to step back and count our blessings especially when we are faced with problems. Having friends and family to count on helps us get through anything’s. Thoughts are with you. Gratitude is powerful. Your words illuminate this power. Even though you are going through health issues, your slice is positive. Wishing you the best. Stacey, it amazing how our attitude and outlook change when we can focus on all the good that we have. Prayers and hugs that you will soon be feeling better. Beautiful ode of gratitude! You do have an amazing support system. So sorry for your medical challenges – be well! You are rich in your circle of love. Thinking of you…. It really does take a village. And when I am overcome with the enormity of what friends will do for me, I remind myself that I would do the same for them and that’s what makes it truly amazing. So sorry you’re facing a difficult time. I’m glad you’re surrounded by many dear friends and family who each offer comfort and support. Wow! That list of gratefulness is a tribute to how blessed you truly are. I love your attitude that this challenge will pass and you will get through it. Peace to you. My thoughts are with you Stacey. Your strength of spirit shines in this post. So glad you have such a loving team to help and hold you close. Thank you for sharing this slice. I’m wishing you all the best; and I needed this wonderful reminder to say thanks for all the little things that make such a big difference.